Whilst ever there have been railways there have been artists keen to paint them. Many famous names have included aspects of the railways in their paintings, including most notably Claude Monet and J M W Turner. This enthusiasm has been kept alive by the formation in the UK of the Guild of Railway Artists, of which there are over two hundred members including the author of this work. 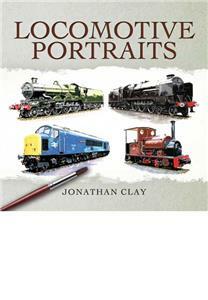 In recent years Jonathan Clay has had many requests to produce his own book of pictures and Locomotive Portraits is the result. Jonathan discovered his own unique style by happy accident - in order to save time for his first railway event in 1999, he painted a series of locomotive pictures without backgrounds, intending to add the scenery later. However, they sold so well that they became the norm and his well-known series of Locomotive Portraits was born. Containing over a 170 pages of stunning artwork, this book is a treat for rail and art lovers alike.